...There are also two fire extinguishers, an extrication vest, water, blankets, kneeling pads for the safety team to work on and even an umbrella. 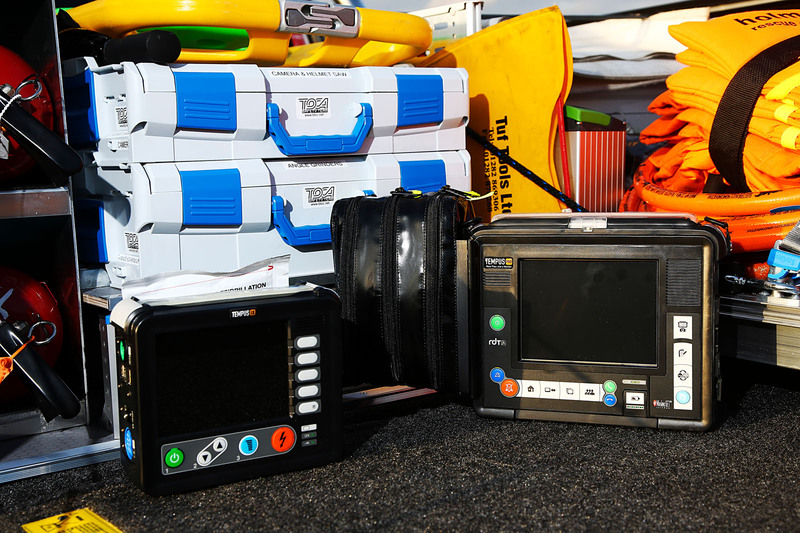 Much of the equipment enables the team to gain access to a car to reach a driver, if required. The F-250 stands out even more in a bright vinyl wrap applied by BossDog. Emergency lights have also been fitted, and tow hooks enable it to move stranded cars. The front passenger has the controls for the emergency lights, including bright floodlights that can help illuminate accident scenes. Investing almost £200,000 in a vehicle that you hope to rarely, if ever, use to its full potential might seem an odd thing to do. But should it ever be called into action, the cost of the British Touring Car Championship’s new safety team truck will absolutely be worth every penny. 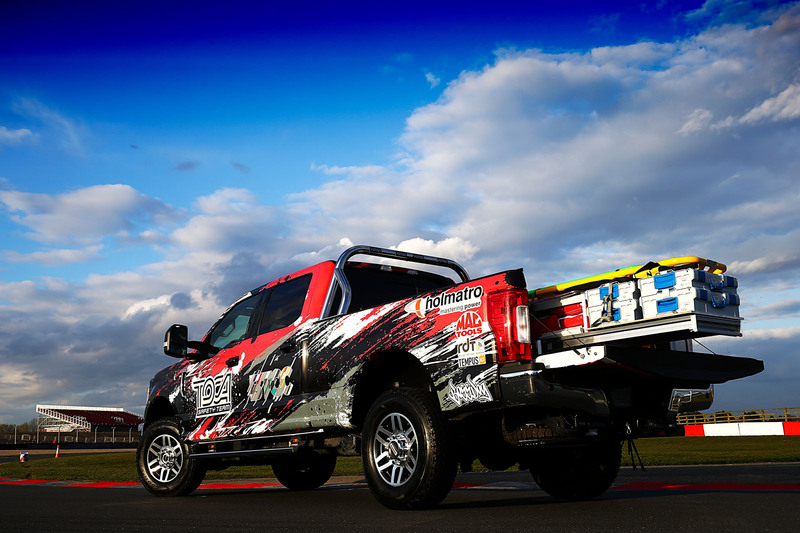 The truck, which will feature at every BTCC event, is packed with cutting-edge tools that will allow the four-person medical team in it to quickly assist trapped or injured drivers. Series boss Alan Gow openly admits he copied the idea from Nascar and IndyCar safety teams in the US, which also partly explains why all those tools are packed onto a 6.8-litre V8 Ford F-250 Laredo. “Since I was taking the idea from America, I thought I might as well get a great big US pick-up rather than using a pathetic local one,” says Gow. The BTCC has a Porsche Panamera Turbo that is used as a fast response medical car, carrying medical director Dr Paul Trafford and emergency equipment to the scene of an incident. But more substantial equipment, such as cutting tools, was previously loaded into a Ford Galaxy and accessing it during an emergency, such as a driver being trapped in a car, was difficult. The Galaxy remains as a support vehicle, but the F-250 has now taken on the role of getting the equipment and trained rescue team to the scene of accidents quickly. Gow used an import specialist to source an F-250 from a Canadian dealer, and then spent three weeks running it in over Christmas (“Given the weather, it was fantastic,” he says), before it was sent for wrapping and then modifying. The modifications were done to specifications laid out by safety team leader Martin Hunt and Trafford. 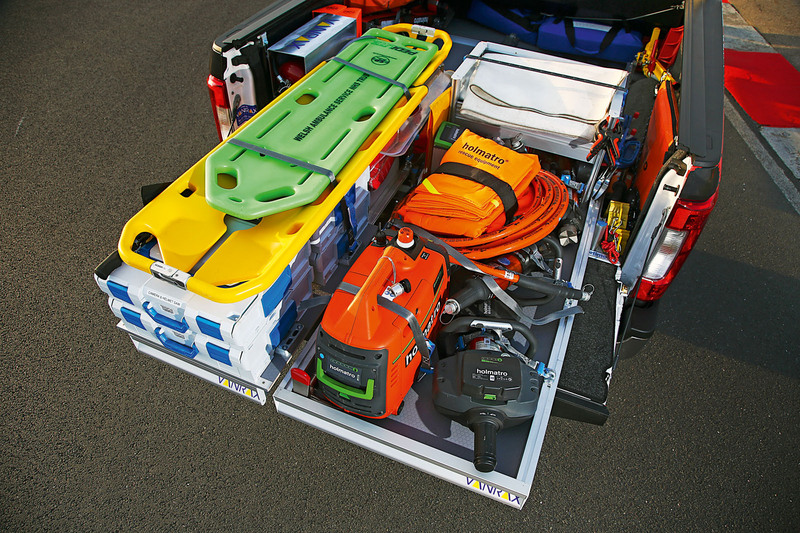 They advised on the equipment needed – provided by Holmatro, MacTools, DeWalt and RDT – and its placement, so they could get to every tool as fast as possible. “We spent a lot of time working out how the equipment would best fit, and what we’d need first in an accident,” says Hunt. The truck was pressed into service to attend the scene of an accident at Donington Park earlier this year. The safety team prefers to dismantle cars rather than cut into them, but if they need to do the latter they have a range of battery- powered Holmatro tools, cutters, saws and rams, along with spare batteries. “Because racing cars need to be strong for crash tests, they use lots of exotic materials to save weight, and having the latest kit is essential in allowing us to actually be able to cut into it,” says Hunt, who adds that the team trained by cutting up the shell of an old BTCC race car. There’s also general equipment that might be useful in an accident, including self-heating blankets, tarpaulins for privacy and towing ropes.